15 t/m 17 juli, Up Close to Nature: On this experimental stitch course we will use both hand and machine embroidery to create a group of small mixed media pieces. We will develop ideas about colour, texture and rhythm from microscopic images of cell structures and small textured natural forms and interpret them using a wide range of fabrics, from traditional to plastic, wire or paper. You will be encouraged to be expressive and experimental with both materials and stitch. Group demonstrations, discussions and individual help will support your learning experience. 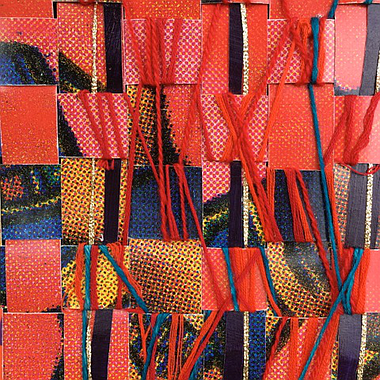 18 en 19 juli, Paper construct and Deconstruct with Stitch & Weave: Using all sorts of paper from brown wrapping paper and old packaging to freshly coloured cartridge paper or tissue. 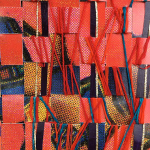 Create a range of textile pieces that incorporate weave, hand and machine stitch and other forms of manipulation to construct and deconstruct relief surfaces. There will be group demonstrations, discussions and individual help throughout the course and students will be encouraged to develop their own style of work. Start om 10 uur met koffie en thee en tussen de middag verzorgt Paco een heerlijke lunch.